This article was originally published by Adarsh Menon on WinningStackBlog. 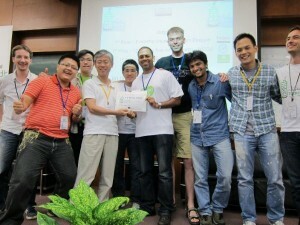 In August, I attended Startup Weekend Taipei. If you’re not familiar with what a Startup Weekend is, it is a weekend event that attracts developers, designers, marketers and anyone with an idea. They get together to form a team, develop an idea over two days, then pitch it in front of judges for a prize on the final evening. The event was sold out and had attracted around 120 attendees. Each attendee wore a name tag with a dot to identify their skill set. Mine was red, signifying “Business / Marketing”. The joke going around was that these were the people with no specific skills. I had come in with several ideas of my own, and was toying with which one was the best for this event. To date, all my projects have been developed on my own, through outsourcing. This was the first time that I would be able to form my own team and manage everyone from the same room. I was looking forward to the process, experience, and the contacts I hoped to make along the way. For most people, the networking is their biggest gain from this event, and I too expected to gain from that. The pitch I ended up doing was an app (web and mobile) to help users search for food items they were craving, and find restaurants nearby that served them. There was a long line-up of about 30 people waiting to present, and I was in the middle of the pack. I didn’t want my pitch to get lost in the shuffle, and wanted a way to stand out so people would remember it. I noticed that most pitches were done in Chinese, since the event was held in Taiwan. I thought about doing my pitch in Chinese as well, but then decided to do it in English. I figured that I wanted the members of my team to be able to speak English, so doing the pitch in English would eliminate non English speakers from joining. It would also make my pitch stand out among English only speakers. Lesson 1: You don’t always need to target the biggest market. It can sometimes be better to be a big fish in a small pond, than a small fish in a big pond. Rather than just describing the problem that I hoped to solve with my product, I told a story of how my pregnant wife always had cravings for particular foods (true story!). For example, she might suddenly want a Kung Pao chicken (宮保雞丁) and would send me out on my scooter to find this food. I talked about how frustrating it was to not know which restaurants served those particular foods, without being able to see their menu first. After the pitches were completed, attendees got to vote on which ideas they wanted to see continue. The top 15 ideas were then selected. Many people came up to me and recognized my pitch among the rest. “You’re the one with the pregnant wife”. Lesson 2: Use stories where possible. People remember stories. As our team was forming, I realized that we needed the right match of skills. We had three coders, a mobile and a marketing person. I was informed that we needed a designer. I sent one of the members out to recruit a designer. He did well, and returned with one shortly. Our team was complete. Lesson 3: Form a team with skills that complement each other well. Your idea is only as good as the team that surrounds it. Our mission that evening was to come up with a team name. This was tough for us, because our target market was local Taiwanese, so traditional English names wouldn’t necessarily work with them. We ran through several combinations. We found some that we really liked, that were promptly rejected by the local Taiwanese members of our team as not being “local friendly”. Eventually we settled on Food Jing, a play on the word 附近 in Chinese which means “nearby”. Lesson 4: Choose a name that resonates with the market being served. The coding team, led by Dobes and Greg spent all day developing the front and back-end of the product, working in tandem with our talented designer,Quaint. Will worked on the mobile aspect. In the mean time, Hao who had previously claimed to have “no relevant experience” was one of the hardest workers on the team – developing a comprehensive customer survey, and then interviewing a lot of people to get feedback on the problem we were trying to solve. Later, he would visit twenty restaurants (the Taipei rains didn’t help his cause) to get feedback from owners there as well. Lesson 5: There are no small roles. Every member of your team can contribute somehow. During the day, several mentors who had been assigned to assist teams, came to visit us to monitor progress. They asked questions about our business model and there were several that I couldn’t answer. After each visit, I found myself redoing parts of the plan to address the raised issue. It seemed that just when we thought we had thought of everything, someone new would point out something we had overlooked. Lesson 6: You can’t see the forest for the trees. When you are truly invested in a project, it is easy to get too focused on the details. Outside opinions can be extremely valuable at these times. If they don’t get it, there’s probably a problem to be fixed. By the end of the day, we had made good progress, but there was still something missing. Our Facebook fan page hadn’t gotten the traction we had hoped it would get. (We would later find out that we had accidentally restricted it to fans in Taiwan only, which blocked a lot of fans from getting through – oops!). So we needed something to get us back some momentum. As part of the marketing team, I noticed that the word foodjing could be used in many creative ways. So I found a freelancer online to create a parody video of “Killing Me Softly” by the Fugees. We would later release it as being by the Food Jies. Fans loved it, and it helped market our brand as being a little zany and over the top. Lesson 7: Problems and challenges will arise in any venture. It’s how you overcome and rise from them that determines your future success. The final day was spent completing the demo and working on our presentation. I decided to build on the momentum we had from the previous day, by ordering tshirts with our logo, for our team to wear on stage. This proved extremely difficult to get done in a single day (on a Sunday no less). Once again, Hao came to the rescue, running across town from vendor to vendor until he found one who could print just one for us. We took it! During the practice presentations, I had worked to overcome all the questions that the mentors had given me the previous day. I invited more to grill me further. Mark Koester recalled a stunt that hisstartup team performed during their final presentation. They had ordered a hot dog during the demo, that was later delivered on stage. We decided to do the same thing in ours by ordering a taco during our demo. Lesson 8: Find ways to make your presentations different from the rest of the pack, so it will be noticed by the judges and audience. One of the visitors who gave us advice, would later turn out to be one of our judges. He asked me about where our revenue would come from. I told him that while Taiwan had a lot of smaller, mom and pop restaurants, we planned to focus on the larger restaurants that could afford to use our services. He frowned and commented that if it was him, he would be focusing on those smaller restaurants, rather than the bigger ones, since that’s where the real opportunity was. I thought about his comment a lot and realized it made sense. I refocused our presentation to emhasize the smaller restaurants and the long tail of food. This also further differentiated our product from competing ones on the market. Lesson 9: The mentors are provided for a reason. Listen to their advice and follow it! It was presentation time. Pandey started us off with massive enthusiasm. During the demo, he showed how a taco could be ordered. During my half of the presentation, the taco was delivered on stage to a thunderous ovation. I wore our branded tshirt underneath, and revealed it during the presentation, which also drew applause. Finally it was down to the judge’s questions. Practice makes perfect. No surprise questions there, so no problem with the answers. The crowd seemed to like the extra touches we had prepared. Lesson 10: Have fun with it. People like to deal with happy people. Judging from the responses, I suspected we had a chance at a top three finish. As the second and third place winners were first revealed, I wondered if coming in first place was possible. Out of the corner of my eye, I thought I noticed Sascha Pallenberg aim his camera phone at me, as if expecting to see us win. Sure enough, we were announced as the winners and pandemonium ensued on our team. All the work we had put in had paid off, and we had come away as winners! Later, I had a chance to mingle with the judges to ask what specifically they had liked about our team. The feedback given included having a clear message of the product we were trying to sell, as well as execution of this idea. Business cards were exchanged. New relationships were formed.